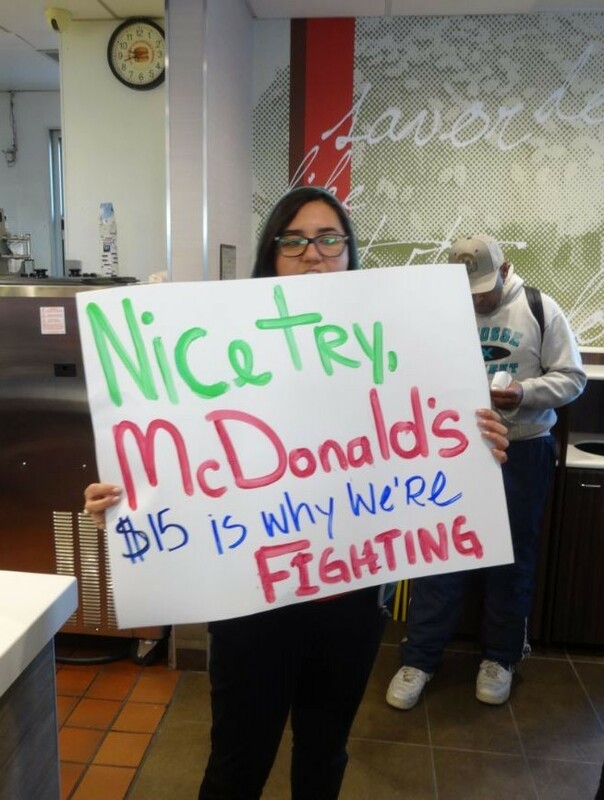 A fast food worker responds to McDonald's wage increase announcement at a rally on April 2. In Oakland, where the fast-food worker movement has been gaining momentum over the past year, workers simultaneously celebrated the wage hike as a victory, and criticized McDonald’s for what they said is still not a large enough pay increase to reach a living wage. Workers and activists say they are fighting instead for $15. The fast-food worker worker campaign is also seeking union representation across the entire fast-food industry to address issues like safety and job security that go beyond the pay check. This morning a group of about two dozen fast-food workers and supporters, including organizers with the union SEIU 1021, and representatives from the Allen Temple Baptist Church, the West Side Missionary Baptist Church, and Oakland Community Organizations, marched to the McDonald’s at 14th and Jackson streets in downtown Oakland calling the company’s announcement an April Fool’s joke, and a cheap stunt. Workers said the pay increase will only benefit a small fraction of McDonald’s employees due to the fact that most McDonald’s employees work for franchisees, not the corporate-owned outlets. According to the McDonald’s press release announcing the wage raises, there 750,000 McDonald’s workers nation-wide, but only 90,000, or about 10 percent, work for the corporation. The move by McDonald’s to increase pay for its largely minimum wage labor force follows a similar announcement by Walmart in February to increase its entry wage to $9 an hour. 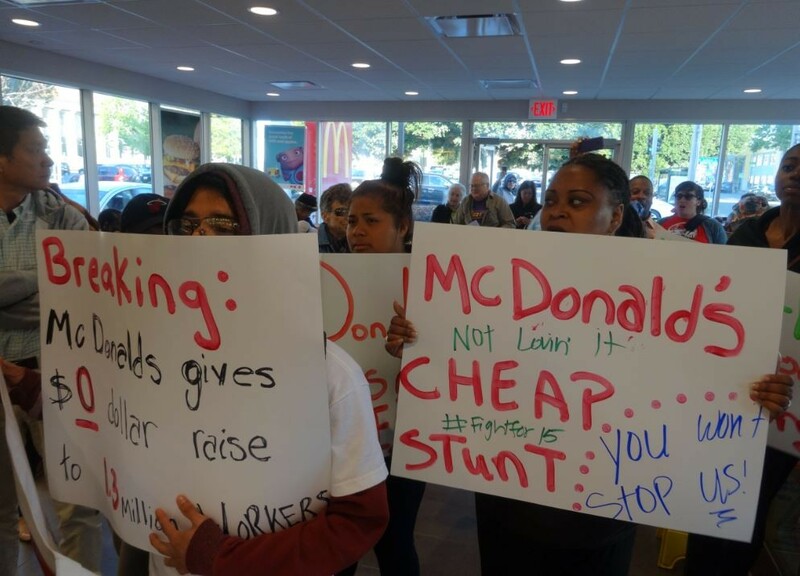 Fast food workers and activists responded to McDonald's April 1 announcement that the company is increases wages and benefits with skepticism.